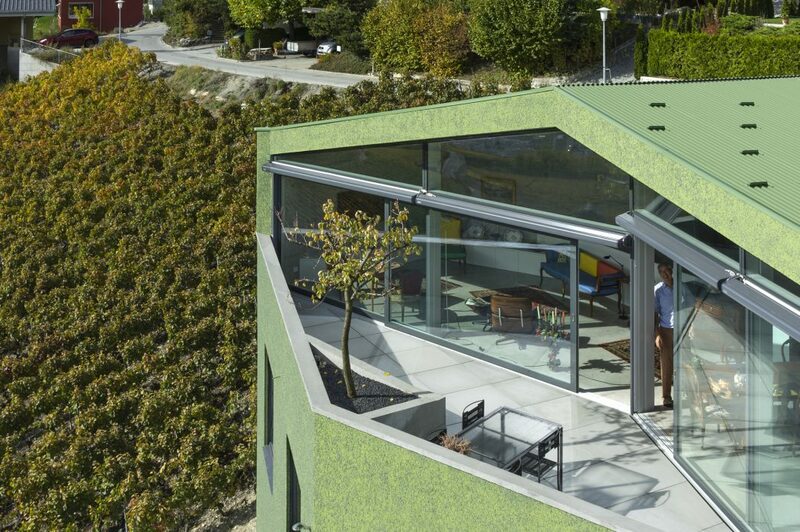 This contemporary single family house located in Venthône, Switzerland, was designed in 2012 by Meyer Architecture. The project is on a steep south-facing slope with views over the Rhône valley. Located at the foot of a neighbourhood of individual houses, on the very top of a vineyard plot, it builds a new front onto the street. The volume is placed in the slope without changing the topography or the character of the land. It is organised over three levels and aims to link up with the road and the view; the footprint on the ground is minimal. The house is covered with a two-colour roughcast render, a mixture of two different shades of greens, which matches the surrounding vineyard?s colours and can blend with them. On the first floor we find the entrance and the living spaces: lounge, dining area and terrace. The terrace is carved into the building and appears to be suspended between earth and sky. It has a privileged relationship with the distant landscape. The lower floor is designed as a large open modular space, where mobile partitions are used to adapt the spaces to needs. Below, in relation to the earth, there is the wine cellar.